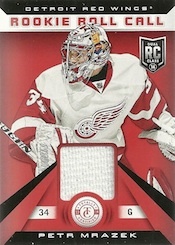 2013-14 Panini Totally Certified Hockey takes the intense and distinct etched mirror foil look to the rink for the first time. 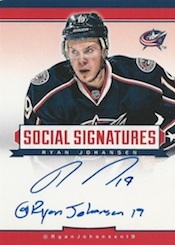 Besides plenty of bright colors, collectors will find one autograph or memorabilia card in every pack. 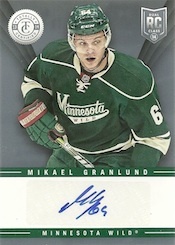 Four-pack boxes promise a minimum of one autograph. For those familiar with Totally Certified, you can expect a similar structure of colored parallels of varying rarities. The result is not only a very colorful set, but one with a big checklist. This makes room for lots of low-numbered cards as well. This rainbow structure isn't just limited to the autographs. It runs throughout the base cards and memorabilia offerings as well. Mirror parallels include Red, Blue, Gold and Green. The Slideshow concept comes to hockey with both regular and autographed versions. As the name suggests, these cards have a slide embedded into the card. 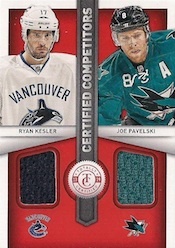 For those working on the double-rookie class, every pack of 2013-14 Panini Totally Certified Hockey has either a rookie card or a rookie parallel. Total print run is 250 per card, or less. Short Prints are noted below. SP = 100 cards or less. 35 cards. Short Prints (SSP/SP) noted below. 17 cards. Short Prints (SSP/SP) noted below. 70 cards. Short Prints (SSP/SP) noted below. 47 cards. Short Prints (SSP/SP) noted below. 44 cards. Short Prints (SSP/SP) noted below. Good: Strong designs throughout, lots of variety, product is over-delivering as far as quantity of promised hits, fun even when you don’t land the big players. The Bottom Line: After feeling a little bit underwhelmed by 2013 Totally Certified Football and 2013-14 Totally Certified Basketball, the brand roars back with hockey. The designs are bold but clean. The inserts show a nice amount of variety rather than simply being one parallel after another. 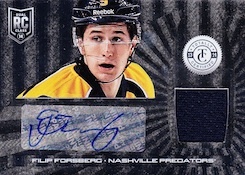 On top of that, many collectors are getting more than the promised four hits per box. I’m one of them having gotten five. Cards aren’t often cheap anymore so when you get more than expected, it’s always a nice feeling even when you’re not landing the biggest players. Just like good music, I don’t mind it when things get loud. That’s long been the signature feature of Totally Certified. This set rights the dull feeling left by basketball and football this year. 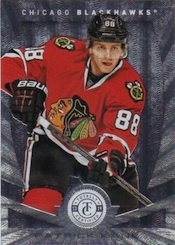 For the base cards, everything but the player image has an etched foil backdrop. The plain foil sides are gone. Instead, the borders radiate out, offering great contrast to the vertical center. Bold designs carry over to the inserts. From embedded slides to the Epix memorabilia cards with their die-cut windows to Clear Cloth, which incorporates an acetate window, there are plenty of distinct parts to the set. And while these might not be for everyone, I like them. The lone exception in the box I broke was the Rookie Roll Call memorabilia cards, which are very standard and get lost in the shuffle when placed alongside the other hits. 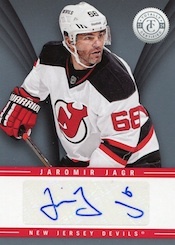 The one drawback of 2013-14 Panini Totally Certified Hockey is the use of sticker autographs. I’ve never been a fan of how the watermark on the stickers go with foil. Where Totally Certified football and basketball were dominated by parallels, as mentioned, hockey goes to great ends to build several distinct inserts. This is a very welcomed change as it gives the product more legs than simply the name and the etched foil angle. As far as player selection goes, a lot of the hits are rookies. With the deep crop, this shouldn’t be overlooked. 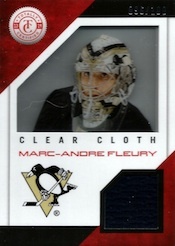 At the same time, it does mean that a lot of the memorabilia cards come from event-worn material rather than game-used gear. Of the four memorabilia cards I found in my box, three were of rookies. 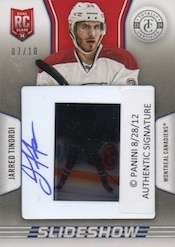 Most products that come with a hit per pack are focused largely on that one card. 2013-14 Titanium Hockey felt this way. This isn’t so with Totally Certified. The best set is attractive and there is the right balance of parallels to make it all seem meaningful. 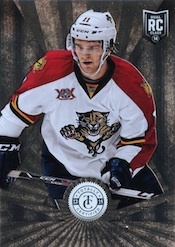 2013-14 Panini Totally Certified also isn’t as expensive as a lot of other hit-per-pack products. This certainly helps as well. Limiting boxes to four packs was a good one because it’s keeping prices reasonable even for those who might not have a big card budget. It’s by no means cheap, but the product does feel very reasonable. The extra hit or two a lot of boxes are getting is merely icing. Totally Certified Hockey was a blast. It might not last long, but there is still a decent amount to mull over. It’s filled with interesting and distinct designs, has some rare content and lots of memorabilia. So far, it’s one of my favorite products of the year as far as enjoyment. Incredible. 4 packs, 6 hits. 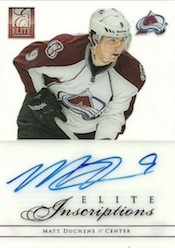 First pack, a MacKinnon/Jones dual jersey, and Sakic triple memorabilia /25. 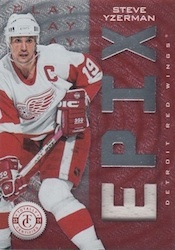 Then, an HRX Video Card redemption for Mark Messier. Then, a rookie auto mirror /25. A Frans Nielson Blue Patch mirror. And multiple RC’s including Jones and Gallagher. Also, a J. Oleksiak Slideshow card! For $80? WOW! Great product- lots of variety and short prints in box. Bought two boxes and two packs last night. First pack I got the EPIX Sidney Crosby Quad Green Moment Card #1/5. This product is loaded with hits and amazing cards. The design is totally stunning and the value is great. 4 packs packed with hits in my box! $80-$100 bucks with taxes and shipping is well worth the buy! Lidstrom auto, Lemiuex EPIC Stick diecut /50, MacKinnon Roll Call jersey, Volchenkov patch /25, and so much more including a rookie slideshow case hit card. I thought I was done with Hockey until I bought a box of these. They are very nice looking and more importantly very fun to open. Great value for the price you pay. Just enough variety and great cards to keep you buying. I bought several more boxes and have not been disappointed. This product is one of the better Panini products this year so far…much better than the other mid-level products such as Select and Prizm. 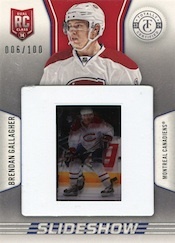 It is a little hit or miss though a lot like the first Panini Certified hockey (2009-10). Some boxes which I believe they consider hot boxes are loaded and can deliver big value, but others are very weak. The reason the value doesn’t hold for the Panini rookies compared to UD is that with all of the variations of the same card there are so many produced. This seems to happen in almost all of there products. The problem is most people don’t care (ex. dominion gold rookies #/50 sell for less than the base #/299 and #/199). Overall worth a buy compared to other low-mid level products this year. The base cards are very nice looking and I actually like the bold look of the rookie roll call cards, but I probably got a “cold” box with none of the acetate or epix cards and so-so rookies. It’s a fun break but I’ll give it 3 stars for being a hit-and-miss product. Outstanding product for the price. Monahan 2-color rookie roll call 50/50, Lundqvist social signatures auto, Hertl rookie roll call patch, and Lemiuex Epix patch and stick 32/50 all in one box. You buy a pack….you get 2 to 4 hits. You buy a box you get 9 to 12 hits….. You buy a case you get 120 hits. Best product by far to come out lately. Plus such a great variety on your hits as well. 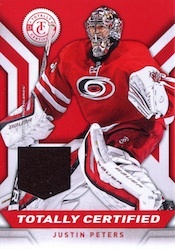 Kudos….very well done Panini !!! Loved this product. At the price point, it seems it packs more punch like others have said. Colored parallels are fun and slideshow cards are really sweet.